Pickard Chilton, an award-winning architecture studio best known for its innovative and cutting-edge design of corporate headquarters and campuses, has been engaged by Cousins Properties to design the new Atlanta, Georgia headquarters for Norfolk Southern, one of the largest railways in the Eastern United States. The railroad is relocating its headquarters from Norfolk, Virginia to a 1-million gsf office tower at 650 West Peachtree Street in Atlanta’s Technology Square district. Norfolk Southern will combine employees from its Norfolk, Virginia and Midtown Atlanta locations, as well as several hundred dispatcher, administrative, and supervisory personnel from NS’ nine divisions across the eastern US. The move is expected to bring 850 jobs to the region, and carries an anticipated completion date of Q3 2021. An official groundbreaking was held in late March, signaling the start of construction. Through Southern Railway and other predecessor railroads, the company can trace its Atlanta roots to the mid-1840s. 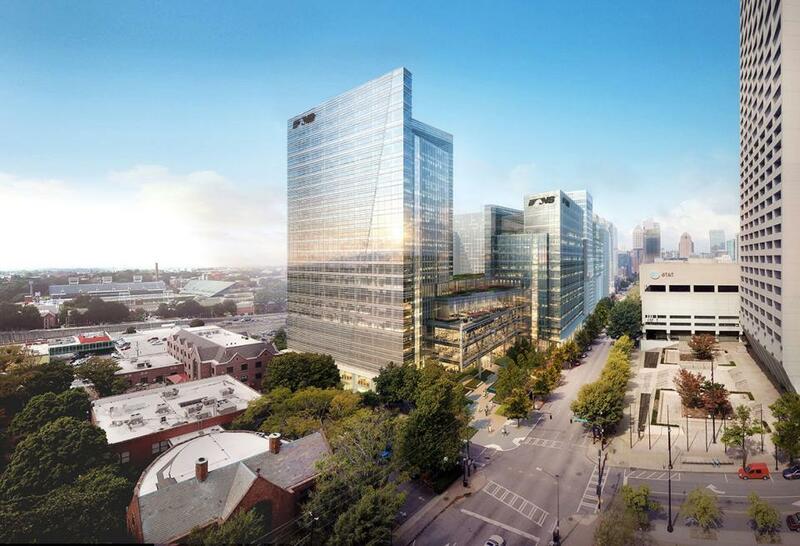 Situated on a 3.4-acre site on West Peachtree Street between Ponce de Leon Avenue and Third Street, Norfolk Southern’s new headquarters will feature two office towers connected by a five-story campus-style hub that serves a destination for employees to work and collaborate throughout the day. The towers are clad in a high-performance enclosure with floor-to-ceiling glass to maximize daylight and views. A lush entry plaza welcomes employees and guests into the building’s lobby, which has soaring ceilings and a coffee shop open to the public. On-site amenities include a vibrant dining facility, an adjacent rooftop garden and private greenspace, a comprehensive fitness center, state-of-the-art conference and training facilities, on-site child-care, and a variety of individual and shared workspaces to serve employees’ diverse needs while promoting interaction and collaboration. Pickard Chilton has designed more than 6.7 million square feet of commercial space for prominent developers in downtown Atlanta over the past 20 years, among them 1180 Peachtree, cited as Building of the Decade 1996 – 2006 by AIA Atlanta, the W Atlanta-Downtown, and One and Three Glenlake. The studio has also designed several projects for Cousins Properties over the years, including The Pinnacle and Emory University Hospital Midtown in Atlanta. It is currently designing two other office towers for Cousins Properties, 901 West Peachtree in Atlanta and 300 Colorado Street in Austin, Texas.